This article is about microprocessors. For central processing units, see CPU. (A Microprocessor is a type of CPU). A microprocessor is a computer processor that incorporates the functions of a central processing unit on a single integrated circuit (IC), or at most a few integrated circuits. The microprocessor is a multipurpose, clock driven, register based, digital integrated circuit that accepts binary data as input, processes it according to instructions stored in its memory, and provides results as output. Microprocessors contain both combinational logic and sequential digital logic. Microprocessors operate on numbers and symbols represented in the binary number system. The integration of a whole CPU onto a single or a few integrated circuits greatly reduced the cost of processing power. Integrated circuit processors are produced in large numbers by highly automated processes, resulting in a low unit price. Single-chip processors increase reliability because there are many fewer electrical connections that could fail. As microprocessor designs improve, the cost of manufacturing a chip (with smaller components built on a semiconductor chip the same size) generally stays the same according to Rock's law. Before microprocessors, small computers had been built using racks of circuit boards with many medium- and small-scale integrated circuits. Microprocessors combined this into one or a few large-scale ICs. Continued increases in microprocessor capacity have since rendered other forms of computers almost completely obsolete (see history of computing hardware), with one or more microprocessors used in everything from the smallest embedded systems and handheld devices to the largest mainframes and supercomputers. 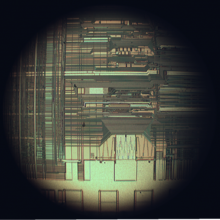 The complexity of an integrated circuit is bounded by physical limitations on the number of transistors that can be put onto one chip, the number of package terminations that can connect the processor to other parts of the system, the number of interconnections it is possible to make on the chip, and the heat that the chip can dissipate. Advancing technology makes more complex and powerful chips feasible to manufacture. A minimal hypothetical microprocessor might include only an arithmetic logic unit (ALU), and a control logic section. The ALU performs addition, subtraction, and operations such as AND or OR. Each operation of the ALU sets one or more flags in a status register, which indicate the results of the last operation (zero value, negative number, overflow, or others). The control logic retrieves instruction codes from memory and initiates the sequence of operations required for the ALU to carry out the instruction. A single operation code might affect many individual data paths, registers, and other elements of the processor. As integrated circuit technology advanced, it was feasible to manufacture more and more complex processors on a single chip. The size of data objects became larger; allowing more transistors on a chip allowed word sizes to increase from 4- and 8-bit words up to today's 64-bit words. Additional features were added to the processor architecture; more on-chip registers sped up programs, and complex instructions could be used to make more compact programs. Floating-point arithmetic, for example, was often not available on 8-bit microprocessors, but had to be carried out in software. Integration of the floating point unit first as a separate integrated circuit and then as part of the same microprocessor chip sped up floating point calculations. Occasionally, physical limitations of integrated circuits made such practices as a bit slice approach necessary. Instead of processing all of a long word on one integrated circuit, multiple circuits in parallel processed subsets of each data word. While this required extra logic to handle, for example, carry and overflow within each slice, the result was a system that could handle, for example, 32-bit words using integrated circuits with a capacity for only four bits each. The ability to put large numbers of transistors on one chip makes it feasible to integrate memory on the same die as the processor. This CPU cache has the advantage of faster access than off-chip memory and increases the processing speed of the system for many applications. Processor clock frequency has increased more rapidly than external memory speed, so cache memory is necessary if the processor is not delayed by slower external memory. A digital signal processor (DSP) is specialized for signal processing. Graphics processing units (GPUs) are processors designed primarily for realtime rendering of images. Microcontrollers integrate a microprocessor with peripheral devices in embedded systems. Systems on chip (SoCs) often integrate one or more microprocessor or microcontroller cores. Thousands of items that were traditionally not computer-related include microprocessors. These include large and small household appliances, cars (and their accessory equipment units), car keys, tools and test instruments, toys, light switches/dimmers and electrical circuit breakers, smoke alarms, battery packs, and hi-fi audio/visual components (from DVD players to phonograph turntables). Such products as cellular telephones, DVD video system and HDTV broadcast systems fundamentally require consumer devices with powerful, low-cost, microprocessors. Increasingly stringent pollution control standards effectively require automobile manufacturers to use microprocessor engine management systems to allow optimal control of emissions over the widely varying operating conditions of an automobile. Non-programmable controls would require complex, bulky, or costly implementation to achieve the results possible with a microprocessor. A microprocessor control program (embedded software) can be easily tailored to different needs of a product line, allowing upgrades in performance with minimal redesign of the product. Different features can be implemented in different models of a product line at negligible production cost. Microprocessor control of a system can provide control strategies that would be impractical to implement using electromechanical controls or purpose-built electronic controls. For example, an engine control system in an automobile can adjust ignition timing based on engine speed, load on the engine, ambient temperature, and any observed tendency for knocking—allowing an automobile to operate on a range of fuel grades. The advent of low-cost computers on integrated circuits has transformed modern society. General-purpose microprocessors in personal computers are used for computation, text editing, multimedia display, and communication over the Internet. Many more microprocessors are part of embedded systems, providing digital control over myriad objects from appliances to automobiles to cellular phones and industrial process control. The first use of the term "microprocessor" is attributed to Viatron Computer Systems describing the custom integrated circuit used in their System 21 small computer system announced in 1968. By the late 1960s, designers were striving to integrate the central processing unit (CPU) functions of a computer onto a handful of very-large-scale integration metal-oxide semiconductor chips, called microprocessor unit (MPU) chipsets. Building on an earlier Busicom design from 1969, Intel introduced the first commercial microprocessor, the 4-bit Intel 4004, in 1971, followed by its 8-bit microprocessor 8008 in 1972. In 1969, Lee Boysel, based on b8-bit arithmetic logic units (3800/3804) he designed earlier at Fairchild, created the Four-Phase Systems Inc. AL-1, an 8-bit CPU slice that was expandable to 32-bits. In 1970, Steve Geller and Ray Holt of Garrett AiResearch designed the MP944 chipset to implement the F-14A Central Air Data Computer on six metal-gate chips fabricated by AMI. The first microprocessors emerged in the early 1970s and were used for electronic calculators, using binary-coded decimal (BCD) arithmetic on 4-bit words. Other embedded uses of 4-bit and 8-bit microprocessors, such as terminals, printers, various kinds of automation etc., followed soon after. Affordable 8-bit microprocessors with 16-bit addressing also led to the first general-purpose microcomputers from the mid-1970s on. Since the early 1970s, the increase in capacity of microprocessors has followed Moore's law; this originally suggested that the number of components that can be fitted onto a chip doubles every year. With present technology, it is actually every two years, and as a result Moore later changed the period to two years. Three projects delivered a microprocessor at about the same time: Garrett AiResearch's Central Air Data Computer (CADC), Texas Instruments' TMS 1000 (September 1971) and Intel's 4004 (November 1971, based on an earlier 1969 Busicom design). Arguably, Four-Phase Systems AL1 microprocessor was also delivered in 1969. The scientific papers and literature published around 1971 reveal that the MP944 digital processor used for the F-14 Tomcat aircraft of the US Navy qualifies as the first microprocessor. Although interesting, it was not a single-chip processor, as was not the Intel 4004 – they both were more like a set of parallel building blocks you could use to make a general-purpose form. It contains a CPU, RAM, ROM, and two other support chips like the Intel 4004. It was made from the same P-channel technology, operated at military specifications and had larger chips – an excellent computer engineering design by any standards. Its design indicates a major advance over Intel, and two year earlier. It actually worked and was flying in the F-14 when the Intel 4004 was announced. It indicates that today's industry theme of converging DSP-microcontroller architectures was started in 1971. This convergence of DSP and microcontroller architectures is known as a digital signal controller. The Four-Phase Systems AL1 was an 8-bit bit slice chip containing eight registers and an ALU. It was designed by Lee Boysel in 1969. At the time, it formed part of a nine-chip, 24-bit CPU with three AL1s, but it was later called a microprocessor when, in response to 1990s litigation by Texas Instruments, a demonstration system was constructed where a single AL1 formed part of a courtroom demonstration computer system, together with RAM, ROM, and an input-output device. The PICO1/GI250 chip introduced in 1971: It was designed by Pico Electronics (Glenrothes, Scotland) and manufactured by General Instrument of Hicksville NY. In 1971, Pico Electronics and General Instrument (GI) introduced their first collaboration in ICs, a complete single chip calculator IC for the Monroe/Litton Royal Digital III calculator. This chip could also arguably lay claim to be one of the first microprocessors or microcontrollers having ROM, RAM and a RISC instruction set on-chip. The layout for the four layers of the PMOS process was hand drawn at x500 scale on mylar film, a significant task at the time given the complexity of the chip. Pico was a spinout by five GI design engineers whose vision was to create single chip calculator ICs. They had significant previous design experience on multiple calculator chipsets with both GI and Marconi-Elliott. The key team members had originally been tasked by Elliott Automation to create an 8-bit computer in MOS and had helped establish a MOS Research Laboratory in Glenrothes, Scotland in 1967. 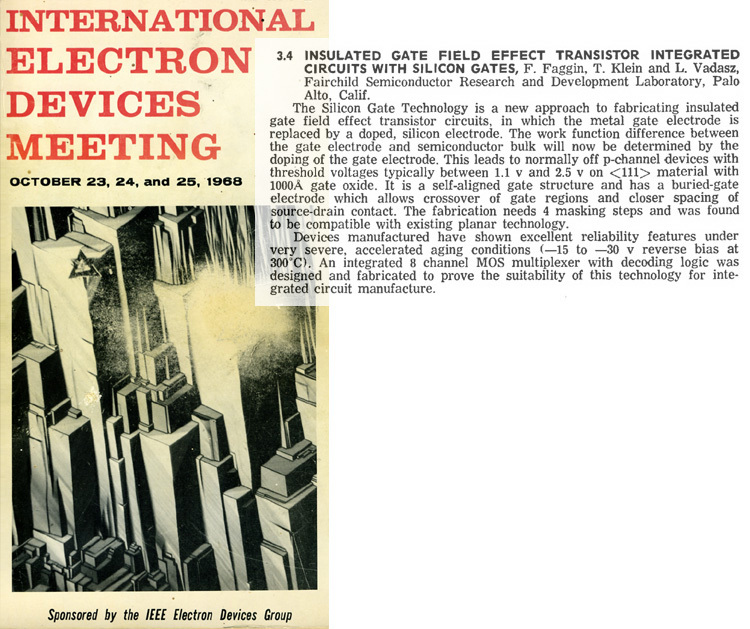 Calculators were becoming the largest single market for semiconductors so Pico and GI went on to have significant success in this burgeoning market. GI continued to innovate in microprocessors and microcontrollers with products including the CP1600, IOB1680 and PIC1650. In 1987, the GI Microelectronics business was spun out into the Microchip PIC microcontroller business. The Intel 4004 is generally regarded as the first commercially available microprocessor, and cost US$60 (equivalent to $371.19 in 2018). The first known advertisement for the 4004 is dated November 15, 1971 and appeared in Electronic News. The microprocessor was designed by a team consisting of Italian engineer Federico Faggin, American engineers Marcian Hoff and Stanley Mazor, and Japanese engineer Masatoshi Shima. The project that produced the 4004 originated in 1969, when Busicom, a Japanese calculator manufacturer, asked Intel to build a chipset for high-performance desktop calculators. Busicom's original design called for a programmable chip set consisting of seven different chips. Three of the chips were to make a special-purpose CPU with its program stored in ROM and its data stored in shift register read-write memory. Ted Hoff, the Intel engineer assigned to evaluate the project, believed the Busicom design could be simplified by using dynamic RAM storage for data, rather than shift register memory, and a more traditional general-purpose CPU architecture. Hoff came up with a four-chip architectural proposal: a ROM chip for storing the programs, a dynamic RAM chip for storing data, a simple I/O device and a 4-bit central processing unit (CPU). Although not a chip designer, he felt the CPU could be integrated into a single chip, but as he lacked the technical know-how the idea remained just a wish for the time being. First microprocessor by Intel, the 4004. While the architecture and specifications of the MCS-4 came from the interaction of Hoff with Stanley Mazor, a software engineer reporting to him, and with Busicom engineer Masatoshi Shima, during 1969, Mazor and Hoff moved on to other projects. In April 1970, Intel hired Italian engineer Federico Faggin as project leader, a move that ultimately made the single-chip CPU final design a reality (Shima meanwhile designed the Busicom calculator firmware and assisted Faggin during the first six months of the implementation). Faggin, who originally developed the silicon gate technology (SGT) in 1968 at Fairchild Semiconductor and designed the world’s first commercial integrated circuit using SGT, the Fairchild 3708, had the correct background to lead the project into what would become the first commercial general purpose microprocessor. Since SGT was his very own invention, Faggin also used it to create his new methodology for random logic design that made it possible to implement a single-chip CPU with the proper speed, power dissipation and cost. The manager of Intel's MOS Design Department was Leslie L. Vadász at the time of the MCS-4 development but Vadász's attention was completely focused on the mainstream business of semiconductor memories so he left the leadership and the management of the MCS-4 project to Faggin, who was ultimately responsible for leading the 4004 project to its realization. Production units of the 4004 were first delivered to Busicom in March 1971 and shipped to other customers in late 1971. Gilbert Hyatt was awarded a patent claiming an invention pre-dating both TI and Intel, describing a "microcontroller". The patent was later invalidated, but not before substantial royalties were paid out. This section and the sections below needs additional citations for verification. Please help improve this article by adding citations to reliable sources. Unsourced material may be challenged and removed. The Intel 4004 was followed in 1972 by the Intel 8008, the world's first 8-bit microprocessor. The 8008 was not, however, an extension of the 4004 design, but instead the culmination of a separate design project at Intel, arising from a contract with Computer Terminals Corporation, of San Antonio TX, for a chip for a terminal they were designing, the Datapoint 2200—fundamental aspects of the design came not from Intel but from CTC. In 1968, CTC's Vic Poor and Harry Pyle developed the original design for the instruction set and operation of the processor. In 1969, CTC contracted two companies, Intel and Texas Instruments, to make a single-chip implementation, known as the CTC 1201. In late 1970 or early 1971, TI dropped out being unable to make a reliable part. In 1970, with Intel yet to deliver the part, CTC opted to use their own implementation in the Datapoint 2200, using traditional TTL logic instead (thus the first machine to run "8008 code" was not in fact a microprocessor at all and was delivered a year earlier). Intel's version of the 1201 microprocessor arrived in late 1971, but was too late, slow, and required a number of additional support chips. CTC had no interest in using it. CTC had originally contracted Intel for the chip, and would have owed them US$50,000 (equivalent to $309,326 in 2018) for their design work. To avoid paying for a chip they did not want (and could not use), CTC released Intel from their contract and allowed them free use of the design. Intel marketed it as the 8008 in April, 1972, as the world's first 8-bit microprocessor. It was the basis for the famous "Mark-8" computer kit advertised in the magazine Radio-Electronics in 1974. This processor had an 8-bit data bus and a 14-bit address bus. The 8008 was the precursor to the successful Intel 8080 (1974), which offered improved performance over the 8008 and required fewer support chips. Federico Faggin conceived and designed it using high voltage N channel MOS. The Zilog Z80 (1976) was also a Faggin design, using low voltage N channel with depletion load and derivative Intel 8-bit processors: all designed with the methodology Faggin created for the 4004. Motorola released the competing 6800 in August 1974, and the similar MOS Technology 6502 in 1975 (both designed largely by the same people). The 6502 family rivaled the Z80 in popularity during the 1980s. A low overall cost, small packaging, simple computer bus requirements, and sometimes the integration of extra circuitry (e.g. the Z80's built-in memory refresh circuitry) allowed the home computer "revolution" to accelerate sharply in the early 1980s. This delivered such inexpensive machines as the Sinclair ZX81, which sold for US$99 (equivalent to $272.83 in 2018). A variation of the 6502, the MOS Technology 6510 was used in the Commodore 64 and yet another variant, the 8502, powered the Commodore 128. The Western Design Center, Inc (WDC) introduced the CMOS WDC 65C02 in 1982 and licensed the design to several firms. It was used as the CPU in the Apple IIe and IIc personal computers as well as in medical implantable grade pacemakers and defibrillators, automotive, industrial and consumer devices. WDC pioneered the licensing of microprocessor designs, later followed by ARM (32-bit) and other microprocessor intellectual property (IP) providers in the 1990s. Motorola introduced the MC6809 in 1978. It was an ambitious and well thought-through 8-bit design that was source compatible with the 6800, and implemented using purely hard-wired logic (subsequent 16-bit microprocessors typically used microcode to some extent, as CISC design requirements were becoming too complex for pure hard-wired logic). Another early 8-bit microprocessor was the Signetics 2650, which enjoyed a brief surge of interest due to its innovative and powerful instruction set architecture. A seminal microprocessor in the world of spaceflight was RCA's RCA 1802 (aka CDP1802, RCA COSMAC) (introduced in 1976), which was used on board the Galileo probe to Jupiter (launched 1989, arrived 1995). RCA COSMAC was the first to implement CMOS technology. The CDP1802 was used because it could be run at very low power, and because a variant was available fabricated using a special production process, silicon on sapphire (SOS), which provided much better protection against cosmic radiation and electrostatic discharge than that of any other processor of the era. Thus, the SOS version of the 1802 was said to be the first radiation-hardened microprocessor. The RCA 1802 had a static design, meaning that the clock frequency could be made arbitrarily low, or even stopped. This let the Galileo spacecraft use minimum electric power for long uneventful stretches of a voyage. Timers or sensors would awaken the processor in time for important tasks, such as navigation updates, attitude control, data acquisition, and radio communication. Current versions of the Western Design Center 65C02 and 65C816 have static cores, and thus retain data even when the clock is completely halted. The Intersil 6100 family consisted of a 12-bit microprocessor (the 6100) and a range of peripheral support and memory ICs. The microprocessor recognised the DEC PDP-8 minicomputer instruction set. As such it was sometimes referred to as the CMOS-PDP8. Since it was also produced by Harris Corporation, it was also known as the Harris HM-6100. By virtue of its CMOS technology and associated benefits, the 6100 was being incorporated into some military designs until the early 1980s. The first multi-chip 16-bit microprocessor was the National Semiconductor IMP-16, introduced in early 1973. An 8-bit version of the chipset was introduced in 1974 as the IMP-8. Other early multi-chip 16-bit microprocessors include one that Digital Equipment Corporation (DEC) used in the LSI-11 OEM board set and the packaged PDP 11/03 minicomputer—and the Fairchild Semiconductor MicroFlame 9440, both introduced in 1975–76. In 1975, National introduced the first 16-bit single-chip microprocessor, the National Semiconductor PACE, which was later followed by an NMOS version, the INS8900. Another early single-chip 16-bit microprocessor was TI's TMS 9900, which was also compatible with their TI-990 line of minicomputers. The 9900 was used in the TI 990/4 minicomputer, the Texas Instruments TI-99/4A home computer, and the TM990 line of OEM microcomputer boards. The chip was packaged in a large ceramic 64-pin DIP package, while most 8-bit microprocessors such as the Intel 8080 used the more common, smaller, and less expensive plastic 40-pin DIP. A follow-on chip, the TMS 9980, was designed to compete with the Intel 8080, had the full TI 990 16-bit instruction set, used a plastic 40-pin package, moved data 8 bits at a time, but could only address 16 KB. A third chip, the TMS 9995, was a new design. The family later expanded to include the 99105 and 99110. The Western Design Center (WDC) introduced the CMOS 65816 16-bit upgrade of the WDC CMOS 65C02 in 1984. The 65816 16-bit microprocessor was the core of the Apple IIgs and later the Super Nintendo Entertainment System, making it one of the most popular 16-bit designs of all time. Intel "upsized" their 8080 design into the 16-bit Intel 8086, the first member of the x86 family, which powers most modern PC type computers. Intel introduced the 8086 as a cost-effective way of porting software from the 8080 lines, and succeeded in winning much business on that premise. The 8088, a version of the 8086 that used an 8-bit external data bus, was the microprocessor in the first IBM PC. Intel then released the 80186 and 80188, the 80286 and, in 1985, the 32-bit 80386, cementing their PC market dominance with the processor family's backwards compatibility. The 80186 and 80188 were essentially versions of the 8086 and 8088, enhanced with some onboard peripherals and a few new instructions. Although Intel's 80186 and 80188 were not used in IBM PC type designs,[dubious – discuss] second source versions from NEC, the V20 and V30 frequently were. The 8086 and successors had an innovative but limited method of memory segmentation, while the 80286 introduced a full-featured segmented memory management unit (MMU). The 80386 introduced a flat 32-bit memory model with paged memory management. The 16-bit Intel x86 processors up to and including the 80386 do not include floating-point units (FPUs). Intel introduced the 8087, 80187, 80287 and 80387 math coprocessors to add hardware floating-point and transcendental function capabilities to the 8086 through 80386 CPUs. The 8087 works with the 8086/8088 and 80186/80188, the 80187 works with the 80186 but not the 80188, the 80287 works with the 80286 and the 80387 works with the 80386. The combination of an x86 CPU and an x87 coprocessor forms a single multi-chip microprocessor; the two chips are programmed as a unit using a single integrated instruction set. The 8087 and 80187 coprocessors are connected in parallel with the data and address buses of their parent processor and directly execute instructions intended for them. The 80287 and 80387 coprocessors are interfaced to the CPU through I/O ports in the CPU's address space, this is transparent to the program, which does not need to know about or access these I/O ports directly; the program accesses the coprocessor and its registers through normal instruction opcodes. 16-bit designs had only been on the market briefly when 32-bit implementations started to appear. The most significant of the 32-bit designs is the Motorola MC68000, introduced in 1979. [dubious – discuss] The 68k, as it was widely known, had 32-bit registers in its programming model but used 16-bit internal data paths, three 16-bit Arithmetic Logic Units, and a 16-bit external data bus (to reduce pin count), and externally supported only 24-bit addresses (internally it worked with full 32 bit addresses). In PC-based IBM-compatible mainframes the MC68000 internal microcode was modified to emulate the 32-bit System/370 IBM mainframe. Motorola generally described it as a 16-bit processor. The combination of high performance, large (16 megabytes or 224 bytes) memory space and fairly low cost made it the most popular CPU design of its class. The Apple Lisa and Macintosh designs made use of the 68000, as did a host of other designs in the mid-1980s, including the Atari ST and Commodore Amiga. The world's first single-chip fully 32-bit microprocessor, with 32-bit data paths, 32-bit buses, and 32-bit addresses, was the AT&T Bell Labs BELLMAC-32A, with first samples in 1980, and general production in 1982. After the divestiture of AT&T in 1984, it was renamed the WE 32000 (WE for Western Electric), and had two follow-on generations, the WE 32100 and WE 32200. These microprocessors were used in the AT&T 3B5 and 3B15 minicomputers; in the 3B2, the world's first desktop super microcomputer; in the "Companion", the world's first 32-bit laptop computer; and in "Alexander", the world's first book-sized super microcomputer, featuring ROM-pack memory cartridges similar to today's gaming consoles. All these systems ran the UNIX System V operating system. The first commercial, single chip, fully 32-bit microprocessor available on the market was the HP FOCUS. Intel's first 32-bit microprocessor was the iAPX 432, which was introduced in 1981, but was not a commercial success. It had an advanced capability-based object-oriented architecture, but poor performance compared to contemporary architectures such as Intel's own 80286 (introduced 1982), which was almost four times as fast on typical benchmark tests. However, the results for the iAPX432 was partly due to a rushed and therefore suboptimal Ada compiler. Motorola's success with the 68000 led to the MC68010, which added virtual memory support. The MC68020, introduced in 1984 added full 32-bit data and address buses. The 68020 became hugely popular in the Unix supermicrocomputer market, and many small companies (e.g., Altos, Charles River Data Systems, Cromemco) produced desktop-size systems. The MC68030 was introduced next, improving upon the previous design by integrating the MMU into the chip. The continued success led to the MC68040, which included an FPU for better math performance. The 68050 failed to achieve its performance goals and was not released, and the follow-up MC68060 was released into a market saturated by much faster RISC designs. The 68k family faded from use in the early 1990s. Other large companies designed the 68020 and follow-ons into embedded equipment. At one point, there were more 68020s in embedded equipment than there were Intel Pentiums in PCs. The ColdFire processor cores are derivatives of the 68020. During this time (early to mid-1980s), National Semiconductor introduced a very similar 16-bit pinout, 32-bit internal microprocessor called the NS 16032 (later renamed 32016), the full 32-bit version named the NS 32032. Later, National Semiconductor produced the NS 32132, which allowed two CPUs to reside on the same memory bus with built in arbitration. The NS32016/32 outperformed the MC68000/10, but the NS32332—which arrived at approximately the same time as the MC68020—did not have enough performance. The third generation chip, the NS32532, was different. It had about double the performance of the MC68030, which was released around the same time. The appearance of RISC processors like the AM29000 and MC88000 (now both dead) influenced the architecture of the final core, the NS32764. Technically advanced—with a superscalar RISC core, 64-bit bus, and internally overclocked—it could still execute Series 32000 instructions through real-time translation. When National Semiconductor decided to leave the Unix market, the chip was redesigned into the Swordfish Embedded processor with a set of on chip peripherals. The chip turned out to be too expensive for the laser printer market and was killed. The design team went to Intel and there designed the Pentium processor, which is very similar to the NS32764 core internally. The big success of the Series 32000 was in the laser printer market, where the NS32CG16 with microcoded BitBlt instructions had very good price/performance and was adopted by large companies like Canon. By the mid-1980s, Sequent introduced the first SMP server-class computer using the NS 32032. This was one of the design's few wins, and it disappeared in the late 1980s. The MIPS R2000 (1984) and R3000 (1989) were highly successful 32-bit RISC microprocessors. They were used in high-end workstations and servers by SGI, among others. Other designs included the Zilog Z80000, which arrived too late to market to stand a chance and disappeared quickly. The ARM first appeared in 1985. This is a RISC processor design, which has since come to dominate the 32-bit embedded systems processor space due in large part to its power efficiency, its licensing model, and its wide selection of system development tools. Semiconductor manufacturers generally license cores and integrate them into their own system on a chip products; only a few such vendors are licensed to modify the ARM cores. Most cell phones include an ARM processor, as do a wide variety of other products. There are microcontroller-oriented ARM cores without virtual memory support, as well as symmetric multiprocessor (SMP) applications processors with virtual memory. From 1993 to 2003, the 32-bit x86 architectures became increasingly dominant in desktop, laptop, and server markets, and these microprocessors became faster and more capable. Intel had licensed early versions of the architecture to other companies, but declined to license the Pentium, so AMD and Cyrix built later versions of the architecture based on their own designs. During this span, these processors increased in complexity (transistor count) and capability (instructions/second) by at least three orders of magnitude. Intel's Pentium line is probably the most famous and recognizable 32-bit processor model, at least with the public at broad. While 64-bit microprocessor designs have been in use in several markets since the early 1990s (including the Nintendo 64 gaming console in 1996), the early 2000s saw the introduction of 64-bit microprocessors targeted at the PC market. With AMD's introduction of a 64-bit architecture backwards-compatible with x86, x86-64 (also called AMD64), in September 2003, followed by Intel's near fully compatible 64-bit extensions (first called IA-32e or EM64T, later renamed Intel 64), the 64-bit desktop era began. Both versions can run 32-bit legacy applications without any performance penalty as well as new 64-bit software. With operating systems Windows XP x64, Windows Vista x64, Windows 7 x64, Linux, BSD, and macOS that run 64-bit natively, the software is also geared to fully utilize the capabilities of such processors. The move to 64 bits is more than just an increase in register size from the IA-32 as it also doubles the number of general-purpose registers. The move to 64 bits by PowerPC had been intended since the architecture's design in the early 90s and was not a major cause of incompatibility. Existing integer registers are extended as are all related data pathways, but, as was the case with IA-32, both floating point and vector units had been operating at or above 64 bits for several years. Unlike what happened when IA-32 was extended to x86-64, no new general purpose registers were added in 64-bit PowerPC, so any performance gained when using the 64-bit mode for applications making no use of the larger address space is minimal. In 2011, ARM introduced a new 64-bit ARM architecture. In the mid-1980s to early 1990s, a crop of new high-performance reduced instruction set computer (RISC) microprocessors appeared, influenced by discrete RISC-like CPU designs such as the IBM 801 and others. RISC microprocessors were initially used in special-purpose machines and Unix workstations, but then gained wide acceptance in other roles. The first commercial RISC microprocessor design was released in 1984, by MIPS Computer Systems, the 32-bit R2000 (the R1000 was not released). In 1986, HP released its first system with a PA-RISC CPU. In 1987, in the non-Unix Acorn computers' 32-bit, then cache-less, ARM2-based Acorn Archimedes became the first commercial success using the ARM architecture, then known as Acorn RISC Machine (ARM); first silicon ARM1 in 1985. The R3000 made the design truly practical, and the R4000 introduced the world's first commercially available 64-bit RISC microprocessor. Competing projects would result in the IBM POWER and Sun SPARC architectures. Soon every major vendor was releasing a RISC design, including the AT&T CRISP, AMD 29000, Intel i860 and Intel i960, Motorola 88000, DEC Alpha. In the late 1990s, only two 64-bit RISC architectures were still produced in volume for non-embedded applications: SPARC and Power ISA, but as ARM has become increasingly powerful, in the early 2010s, it became the third RISC architecture in the general computing segment. A different approach to improving a computer's performance is to add extra processors, as in symmetric multiprocessing designs, which have been popular in servers and workstations since the early 1990s. Keeping up with Moore's law is becoming increasingly challenging as chip-making technologies approach their physical limits. In response, microprocessor manufacturers look for other ways to improve performance so they can maintain the momentum of constant upgrades. A multi-core processor is a single chip that contains more than one microprocessor core. Each core can simultaneously execute processor instructions in parallel. This effectively multiplies the processor's potential performance by the number of cores, if the software is designed to take advantage of more than one processor core. Some components, such as bus interface and cache, may be shared between cores. Because the cores are physically close to each other, they can communicate with each other much faster than separate (off-chip) processors in a multiprocessor system, which improves overall system performance. In 2001, IBM introduced the first commercial multi-core processor, the monolithic two-core POWER4. Personal computers did not receive multi-core processors until the 2005 introduction, of the two-core Intel Pentium D. The Pentium D, however, was not a monolithic multi-core processor. It was constructed from two dies, each containing a core, packaged on a multi-chip module. The first monolithic multi-core processor in the personal computer market was the AMD Athlon X2, which was introduced a few weeks after the Pentium D. As of 2012[update], dual- and quad-core processors are widely used in home PCs and laptops, while quad-, six-, eight-, ten-, twelve-, and sixteen-core processors are common in the professional and enterprise markets with workstations and servers. Sun Microsystems has released the Niagara and Niagara 2 chips, both of which feature an eight-core design. The Niagara 2 supports more threads and operates at 1.6 GHz. High-end Intel Xeon processors that are on the LGA 775, LGA 1366, and LGA 2011 sockets and high-end AMD Opteron processors that are on the C32 and G34 sockets are DP (dual processor) capable, as well as the older Intel Core 2 Extreme QX9775 also used in an older Mac Pro by Apple and the Intel Skulltrail motherboard. AMD's G34 motherboards can support up to four CPUs and Intel's LGA 1567 motherboards can support up to eight CPUs. Modern desktop computers support systems with multiple CPUs, but few applications outside of the professional market can make good use of more than four cores. Both Intel and AMD currently offer fast quad, hex and octa-core desktop CPUs, making multi-CPU systems obsolete for many purposes. The desktop market has been in a transition towards quad-core CPUs since Intel's Core 2 Quad was released and are now common, although dual-core CPUs are still more prevalent. Older or mobile computers are less likely to have more than two cores than newer desktops. Not all software is optimised for multi-core CPUs, making fewer, more powerful cores preferable. AMD offers CPUs with more cores for a given amount of money than similarly priced Intel CPUs—but the AMD cores are somewhat slower, so the two trade blows in different applications depending on how well-threaded the programs running are. For example, Intel's cheapest Sandy Bridge quad-core CPUs often cost almost twice as much as AMD's cheapest Athlon II, Phenom II, and FX quad-core CPUs but Intel has dual-core CPUs in the same price ranges as AMD's cheaper quad-core CPUs. In an application that uses one or two threads, the Intel dual-core CPUs outperform AMD's similarly priced quad-core CPUs—and if a program supports three or four threads the cheap AMD quad-core CPUs outperform the similarly priced Intel dual-core CPUs. Historically, AMD and Intel have switched places as the company with the fastest CPU several times. Intel currently leads on the desktop side of the computer CPU market, with their Sandy Bridge and Ivy Bridge series. In servers, AMD's new Opterons seem to have superior performance for their price point. This means that AMD are currently more competitive in low- to mid-end servers and workstations that more effectively use fewer cores and threads. Taken to the extreme, this trend also includes manycore designs, with hundreds of cores, with qualitatively different architectures. In 1997, about 55% of all CPUs sold in the world were 8-bit microcontrollers, of which over 2 billion were sold. In 2002, less than 10% of all the CPUs sold in the world were 32-bit or more. Of all the 32-bit CPUs sold, about 2% are used in desktop or laptop personal computers. Most microprocessors are used in embedded control applications such as household appliances, automobiles, and computer peripherals. Taken as a whole, the average price for a microprocessor, microcontroller, or DSP is just over US$6 (equivalent to $8.36 in 2018). In 2003, about US$44 (equivalent to $59.93 in 2018) billion worth of microprocessors were manufactured and sold. Although about half of that money was spent on CPUs used in desktop or laptop personal computers, those count for only about 2% of all CPUs sold. The quality-adjusted price of laptop microprocessors improved −25% to −35% per year in 2004–2010, and the rate of improvement slowed to −15% to −25% per year in 2010–2013. About 10 billion CPUs were manufactured in 2008. Most new CPUs produced each year are embedded. ^ Krishna Kant Microprocessors And Microcontrollers: Architecture Programming And System Design, PHI Learning Pvt. Ltd., 2007 ISBN 81-203-3191-5, page 61, describing the iAPX 432. ^ CMicrotek. "8-bit vs 32-bit Micros" Archived 2014-07-14 at the Wayback Machine. ^ "Managing the Impact of Increasing Microprocessor Power Consumption" (PDF). Rice University. Archived (PDF) from the original on October 3, 2015. Retrieved October 1, 2015. ^ Viatron Computer Systems. "System 21 is Now!" Archived 2011-03-21 at the Wayback Machine (PDF). ^ Moore, Gordon (19 April 1965). "Cramming more components onto integrated circuits" (PDF). Electronics. 38 (8). Archived from the original (PDF) on 18 February 2008. Retrieved 2009-12-23. ^ "Excerpts from A Conversation with Gordon Moore: Moore's Law" (PDF). Intel. 2005. Archived from the original (PDF) on 2012-10-29. Retrieved 2009-12-23. ^ Holt, Ray M. "World's First Microprocessor Chip Set". Ray M. Holt website. Archived from the original on January 6, 2014. Retrieved 2010-07-25. ^ Holt, Ray (27 September 2001). Lecture: Microprocessor Design and Development for the US Navy F14 FighterJet (Speech). Room 8220, Wean Hall, Carnegie Mellon University, Pittsburgh, PA, US. Archived from the original on 1 October 2011. Retrieved 2010-07-25. ^ Parab, Jivan S.; Shelake, Vinod G.; Kamat, Rajanish K.; Naik, Gourish M. (2007). Exploring C for Microcontrollers: A Hands on Approach (PDF). Springer. p. 4. ISBN 978-1-4020-6067-0. Archived (PDF) from the original on 2011-07-20. Retrieved 2010-07-25. ^ Dyer, S. A.; Harms, B. K. (1993). "Digital Signal Processing". In Yovits, M. C. (ed.). Advances in Computers. 37. Academic Press. pp. 104–107. doi:10.1016/S0065-2458(08)60403-9. ISBN 9780120121373. Archived from the original on 2016-12-29. ^ Basset, Ross (2003). "When is a Microprocessor not a Microprocessor? The Industrial Construction of Semiconductor Innovation". In Finn, Bernard (ed.). Exposing Electronics. Michigan State University Press. p. 121. ISBN 978-0-87013-658-0. Archived from the original on 2014-03-30. ^ "1971 - Microprocessor Integrates CPU Function onto a Single Chip". The Silicon Engine. Computer History Museum. Archived from the original on 2010-06-08. Retrieved 2010-07-25. ^ Shaller, Robert R. (15 April 2004). "Technological Innovation in the Semiconductor Industry: A Case Study of the International Technology Roadmap for Semiconductors" (PDF). George Mason University. Archived (PDF) from the original on 2006-12-19. Retrieved 2010-07-25. ^ RW (3 March 1995). "Interview with Gordon E. Moore". LAIR History of Science and Technology Collections. Los Altos Hills, California: Stanford University. Archived from the original on 11 March 2012. ^ Bassett 2003. pp. 115, 122. ^ McGonigal, James (20 September 2006). "Microprocessor History: Foundations in Glenrothes, Scotland". McGonigal personal website. Archived from the original on 20 July 2011. Retrieved 2009-12-23. ^ Tout, Nigel. "ANITA at its Zenith". Bell Punch Company and the ANITA calculators. Archived from the original on 2010-08-11. Retrieved 2010-07-25. ^ Mack, Pamela E. (30 November 2005). "The Microcomputer Revolution". Archived from the original on 14 January 2010. Retrieved 2009-12-23. ^ "History in the Computing Curriculum" (PDF). Archived from the original (PDF) on 2011-07-19. Retrieved 2009-12-23. ^ Bright, Peter (November 15, 2011). "The 40th birthday of—maybe—the first microprocessor, the Intel 4004". arstechnica.com. Archived from the original on January 6, 2017. ^ Faggin, Federico; Hoff, Marcian E., Jr.; Mazor, Stanley; Shima, Masatoshi (December 1996). "The History of the 4004". IEEE Micro. 16 (6): 10–20. doi:10.1109/40.546561. Archived from the original on 2013-02-16. ^ Faggin, F.; Klein, T.; Vadasz, L. (23 October 1968). Insulated Gate Field Effect Transistor Integrated Circuits with Silicon Gates (JPEG image). International Electronic Devices Meeting. IEEE Electron Devices Group. Archived from the original on 19 February 2010. Retrieved 2009-12-23. ^ "The Gilbert Hyatt Patent". intel4004.com. Federico Faggin. Archived from the original on 2009-12-26. Retrieved 2009-12-23. ^ Crouch, Dennis (1 July 2007). "Written Description: CAFC Finds Prima Facie Rejection (Hyatt v. Dudas (Fed. Cir. 2007))". Patently-O blog. Archived from the original on 4 December 2009. Retrieved 2009-12-23. ^ Ceruzzi, Paul E. (May 2003). A History of Modern Computing (2nd ed.). MIT Press. pp. 220–221. ISBN 978-0-262-53203-7. ^ a b c Wood, Lamont (August 2008). "Forgotten history: the true origins of the PC". Computerworld. Archived from the original on 2011-01-07. Retrieved 2011-01-07. ^ Intel 8008 data sheet. ^ The 80187 only has a 16-bit data bus because it used the 80387SX core. ^ "Essentially, the 80C187 can be treated as an additional resource or an extension to the CPU. The 80C186 CPU together with an 80C187 can be used as a single unified system." Intel 80C187 datasheet, p. 3, November 1992 (Order Number: 270640-004). ^ "Priorartdatabase.com". Priorartdatabase.com. 1986-01-01. Retrieved 2014-06-09. ^ "Shoji, M. Bibliography". Bell Laboratories. 7 October 1998. Archived from the original on 16 October 2008. Retrieved 2009-12-23. ^ "Timeline: 1982–1984". Physical Sciences & Communications at Bell Labs. Bell Labs, Alcatel-Lucent. 17 January 2001. Archived from the original on 2011-05-14. Retrieved 2009-12-23. ^ Turley, Jim (July 1998). "MCore: Does Motorola Need Another Processor Family?". Embedded Systems Design. TechInsights (United Business Media). Archived from the original on 1998-07-02. Retrieved 2009-12-23. ^ Garnsey, Elizabeth; Lorenzoni, Gianni; Ferriani, Simone (March 2008). "Speciation through entrepreneurial spin-off: The Acorn-ARM story" (PDF). Research Policy. 37 (2): 210–224. doi:10.1016/j.respol.2007.11.006. Retrieved 2011-06-02. [...] the first silicon was run on April 26th 1985. ^ Cantrell, Tom (1998). "Microchip on the March". Archived from the original on 2007-02-20. ^ a b Turley, Jim (18 December 2002). "The Two Percent Solution". Embedded Systems Design. TechInsights (United Business Media). Archived from the original on 3 April 2015. Retrieved 2009-12-23. ^ WSTS Board Of Directors. "WSTS Semiconductor Market Forecast World Release Date: 1 June 2004 - 6:00 UTC". Miyazaki, Japan, Spring Forecast Meeting 18–21 May 2004 (Press release). World Semiconductor Trade Statistics. Archived from the original on 2004-12-07. ^ Sun, Liyang (2014-04-25). "What We Are Paying for: A Quality Adjusted Price Index for Laptop Microprocessors". Wellesley College. Archived from the original on 2014-11-11. Retrieved 2014-11-07. … compared with -25% to -35% per year over 2004-2010, the annual decline plateaus around -15% to -25% over 2010-2013. ^ Barr, Michael (1 August 2009). "Real men program in C". Embedded Systems Design. TechInsights (United Business Media). p. 2. Archived from the original on 22 October 2012. Retrieved 2009-12-23. Ray, A. K.; Bhurchand, K.M. Advanced Microprocessors and Peripherals. India: Tata McGraw-Hill. Dirk Oppelt. "The CPU Collection". Retrieved 2009-12-23. Gennadiy Shvets. "CPU-World". Retrieved 2009-12-23. Jérôme Cremet. "The Gecko's CPU Library". Retrieved 2009-12-23. "How Microprocessors Work". Retrieved 2009-12-23. William Blair. "IC Die Photography". Retrieved 2009-12-23. John Bayko (December 2003). "Great Microprocessors of the Past and Present". Archived from the original on 2013-04-15. Retrieved 2009-12-23. Wade Warner (22 December 2004). "Great moments in microprocessor history". IBM. Retrieved 2013-03-07. Ray M. Holt. "theDocuments". World’s First Microprocessor. Retrieved 2009-12-23.